"Polar Bear Air Conditioning and Heating delivered our multizone renovation project on time, on budget and with high quality results. Thanks men and come back to enjoy a pint sometime." –Gary and Tom, Irish Channel Restaurant and Pub, Washington D.C.
Air conditioning and heating are important aspects of the daily operation of any successful business. Your employees and customers need to be comfortable enough to enjoy the time spent in your business. You need a comfort system that will maintain comfortable indoor temperatures throughout the year, ensuring the highest level of comfort for everyone in the building. Polar Bear Air Conditioning provides the best possible commercial heating and AC service for business owners throughout Washington D.C., Loudoun County and the surrounding Northern Virginia area. Our goal is to ensure you never need to worry about your heating, cooling, or ventilation systems ever again. So, if you need assistance with commercial HVAC installation, maintenance or repair, call us today. 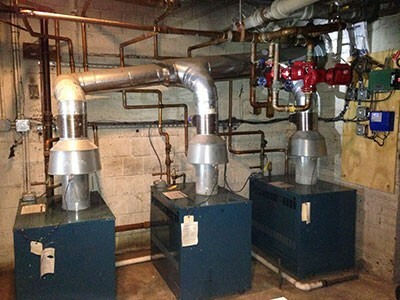 The first step is to find a heating and cooling system for your business that will provide optimal comfort control without costing too much to operate. There are a number of solutions we offer depending on the size and needs of your business. For smaller spaces, we have a combination of packaged systems, furnaces and heat pumps that will provide heating and air for your business throughout the year. These systems are designed to provide dual comfort control with less fuel consumption and quieter operation. We have a full line of highly efficient boilers designed to provide the best possible heating experience to your business. Make sure you have a full heat load calculation done on your commercial space before choosing a boiler to ensure you get the right sized system in place. As a business owner, if you’re faced the prospect of replacing your system, you want as little interruption to operations as possible, but you no doubt also want it done well, so you don’t have to worry about it again. With years of experience replacing commercial systems in Washington, DC and Northern Virginia, Polar Bear Air Conditioning has the knowledge and skills needed to complete any commercial heating and air conditioning job. 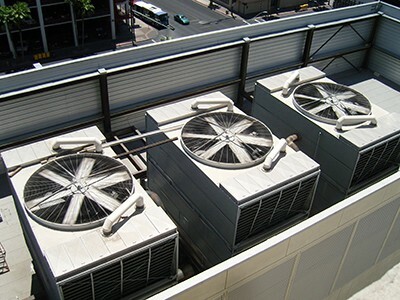 Our highly trained HVAC contractors have the skills and experience necessary to handle the replacement of your commercial system from start to finish. If you’re concerned about the current state of your heating and cooling system, there are a few things to keep in mind. First, even the smallest sign of a problem should be checked out immediately. We offer a full line of repair services designed to pinpoint the problem as quickly as possible and not just fix it, but diagnose the source of the problem so it doesn’t happen again. Look for common signs like uneven heating or cooling throughout your commercial space, complaints from customers about cold– or hot–spots, and extra loud noises being emitted from the system. If you notice that your heating and cooling system is no longer doing the job the way it once did, service is necessary and our trained experts can help. Of course, ideally you’d avoid having to call for repairs in the first place, which is where regular maintenance comes in to play. We offer a full range of maintenance services for boilers, packaged systems, heat pumps and central AC systems so you never need to worry about something going wrong. Annual checkups as well as pre–season inspections and regular testing of any boiler or fuel–based systems is highly recommended for optimal performance. If you’re tired of extra money being poured into your comfort system, there are a number of things you can do. Most importantly, you need a trustworthy commercial heating and air conditioning technician to replace your old system or attend to any problems your current system is having. Polar Bear performs expert commercial HVAC service for businesses throughout Washington D.C., Loudoun County and the surrounding Northern Virginia area to ensure they maintain comfortable year–round temperatures.